Now that Rep. Ocasio-Cortez wants to raise the top personal income tax rate to 70% and Rep. Ilhan Omar thinks 90% would be even better, it might be a good time to review the history over time from 1960 to 2013 of: a) the top marginal tax rate in every year and b) the share of total income taxes collected from the top one-half percent of taxpayers. 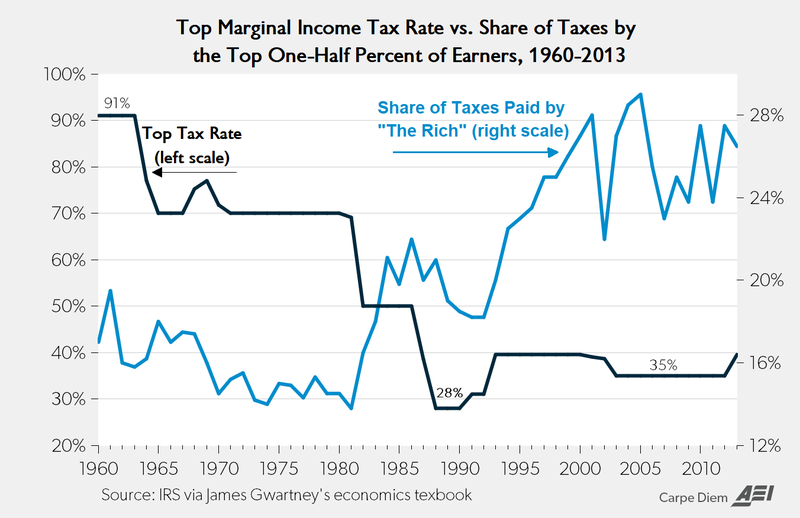 As the chart above shows, the share of taxes collected from “the rich” increased over time from about 14-15% in the 1970s to almost double that amount by the late 1990s and was as high as 29% in 2005, during a period when the top marginal income tax declined from 91% in the early 1906s to 70% in the 1970s, and then to 50% and 28% under Reagan’s tax reforms, before increasing to between 35-40% from 1993 to 2013. On pp. 98-99 of Thomas Sowell’s latest book Discrimination and Disparities, he discusses the relationship between tax rates and tax revenues and the evidence that shows they often move in opposite directions, i.e., cuts in tax rates (and even “tax cuts for the rich”) can produce greater tax revenue (and increase the tax share/burden on the rich). All that the government can do in reality is change the tax rate. How much tax revenue that will produce depends on how people react. There have been some times when higher tax rates have produced lower tax revenues, and some other times when lower tax rate have produced higher tax revenues. In the 1920s, for example, the tax rate on the highest incomes was reduced from 73 percent to 24 percent– and the income tax revenue rose substantially — especially tax revenues received from people in the highest income brackets. In terms of words on paper, the official tax rate was cut from 73 percent to 24 percent. But in terms of events in the real world, the tax rate actually paid — on staggering sums of money previously hidden in tax shelters — rose from zero percent to 24 percent. This produced huge increases in tax revenues received from high-income people, both absolutely and as a percentage of all income taxes collected. That is because 24 percent of something is larger than 73% of nothing. But none of these facts has made the slightest difference to those who continue to call tax rate reductions “tax cuts for the rich,” even when high-income people end up paying more tax revenue than before. The very possibility that tax rates and tax revenues can move in opposite directions has seldom been mentioned in the media — a crucial error of omission. We know with certainty that a decrease in the Tax Rate (%) will increase the Tax Base (and vice-versa), because of the incentive/disincentive effects of taxes summarized in the common saying that “If you tax something, you get less of it; if you subsidize something (or tax it less) you get more of it.” The only uncertainty is how much the Tax Base changes in response to changes in the Tax Rate. In the historical case Sowell used above, the response of the Tax Base to the reductions in the Tax Rate (%) during the 1920s was so large that it resulted in significant increases in Tax Revenues. In other cases like in 1990, Congress levied a 10% luxury tax on expensive cars, boats, jewelry and furs, and private planes expecting to “soak the rich” and raise a lot of Tax Revenue. But the Tax Base shrunk so dramatically that “the luxury tax took in $97 million less in their first year than had been projected — for the simple reason that people were buying a lot fewer of these goods,” as the Wall Street Journal reported in 2003. If AOC and Omar really want to “tax/soak the rich” and make them pay more in taxes and increase their tax burden as a share of total taxes collected, an increase in the top marginal tax rate to 70-90% is the wrong approach. As history shows, that would lower the tax burden on the rich and increase the tax burden on the non-rich. Instead, the Congresswomen might be more successful in achieving their goal of punishing the rich if there were to instead lower the top marginal tax rate, which could “produce increases in tax revenues received from high-income people, both absolutely and as a percentage of all income taxes collected” as Thomas Sowell explains above and as the chart above illustrates graphically.